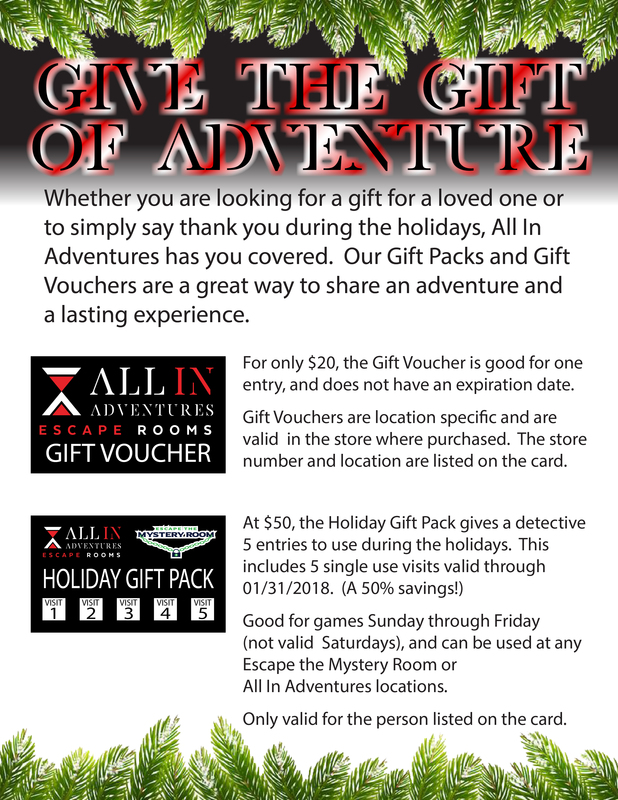 All In Adventures escape rooms are where companies come to work a little and play a lot. For your next team outing, try something a little different. Transform any corporate or team event into an extraordinary success. Whether you’re planning business meetings, brainstorming sessions, holiday parties, team building, employee appreciation or customer appreciation event we’re here to help. Unlike outings that sometimes pit people against one another, All In Adventures escape rooms encourage team participation, inclusion and cohesion. Your team will use essential skills to work together in a fun and exciting, hands-on experience, deciphering clues and solving puzzles. Each team member has a chance to contribute and engage during the activity. Don’t hesitate! Call us today to reserve a time for you and your group to work together, strengthen as a team, and try to escape one, or more, of our challenging rooms. Chevron down We want to play the game as our Team-building activity for a small group. How can we do that? You can book out a whole room online or call us and we can put your Team-Building package together. Chevron down Can you accommodate large groups? Yes, while we may not be able to accommodate your entire group into 1 room we can set your group up into multiple teams to start all at the same time. Full facility capacity varies by location, but we have successfully hosted groups as large as several hundred people! Chevron down What types of organizations typically book your venue? Our clients have ranged from large companies, schools, universities, churches, charity organizations, retailers, police departments, etc. Chevron down Can we bring our own food? What food options do you offer? Due to state health regulations, guests are not allowed to bring their own food. However, we take care of everything for you and your team! In most locations, we offer a standard pizza package option, and can also offer custom sandwich platter package or catering option in our separate party room for your team to enjoy after their escape experience. Chevron down Can my company book the event/party without purchasing food or the escape room experience? Sure. Simply contact your local store for details and pricing options. Since each event may require different needs, we are not able to quote a blanket rate for your event, but our corporate sales team will be happy to walk you through everything and provide you with an upfront cost before you book the event with us. Chevron down How do I book a team event at my local escape room? Contact the Sales office @ [email protected] or 1-844-502-5546 ex. 709. "As part of our annual leadership conference, we invited 150 managers to Escape the Mystery Room in Austin. Scott did a great job helping me organize the event, and Maria and Brian helped ensure that the day went smoothly. It was a great team building exercise that generated a lot of excitement, as well as lessons that could be applied in the workplace. Everyone had a wonderful time, and I had many managers asking how they could bring their own teams to the Mystery Room. I would highly recommend this experience!" “Here at PNC Bank we like to support our local business owners by pouring back into their businesses. On December 11, 2017 a group of PNC Executives such as; Regional Manager, Sr. Sales and Client Experience Specialist, and Branch Managers participated in a team outing a Mystery Room Sugarloaf. It was a total of 17 leaders. As soon as we walked in we were greeted by the Mystery room staff member. She was very polite, patient, and knowledgeable. The facility is nice and each room was organized to perfection. The BEST part of our team building exercise was that we ALL escaped the different rooms assigned to us. We truly enjoyed our 1st experience! Mystery Room, you all ROCK! As the Assistant Vice President, Branch Manager for a large financial Institution, I would recommend to anyone!"